It is typical for my daughter Liz to say (when she comes home), “It is so good to be doing dishes with someone who knows how to load the dishwasher correctly!” It always makes me laugh, and I tell her, “Actually there are several ways to load it, Liz!” But she goes on to explain how her boyfriend does it all wrong… That plates should point one direction, etc, etc. I’m getting to my point, but follow me with another personal example… My daughters are both Gator fans. Could they be anything else, being born and raised here in Gainesville? I don’t know that it ever was a conscious choice on their part. As doctors, and simply as good human beings living in a global community, it is important to remember that we bring our personal perspective to everything. We have our personal “Truth.” And that is fine. Many of us have our religious preferences, political ideals, our personal set of morals, and our “way to load the dishwasher.” If you have not noticed already, our patients bring those with them into their health care problems. Some of the families believe that their health outcome will depend more on prayer than on the chemotherapy or the meds they are receiving. Some believe that their way of seeing or believing in God is the ONLY WAY. Some do not even trust comfort or care from someone that is of a different ethnicity. Some of our sickle cell patients believe that white doctors cannot possibly sympathize with them – and sometimes we prove them right! There have been parents who do not want their child treated by a female physician – especially one that does not speak English well. They think that a doctor that fumbles the English language may be fumbling their medical skills! Some of our doctors are agnostic and yet must deal regularly with families that are talking about prayer or may even ask them to pray with them. They are being asked to “load the dishwasher” the way that family wants it loaded. This too is good palliative care. As a physician, one cannot come in a room to care and comfort a patient and get into political, religious and moral debates with the family. There are situations however that require those kind of discussions, but these must still be handled with care. We must understand that the person you are speaking with is extremely concerned about their child, and in their mind “the dishwasher” should be loaded in the way he/she thinks is right. Most parents do not get into debates with the doctors about medical questions; they know they are out of their league there. But when it comes to comfort and what brings them and their family comfort, they are particular and specific. Doctors and Streetlight members need to be sensitive to that. Last week’s Turkey dinner was a very real and specific comfort to many parents. 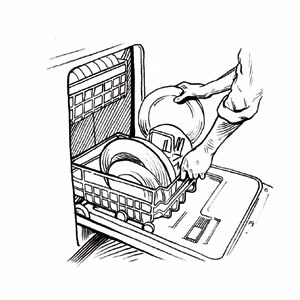 Most families will let you know pretty quickly how they “load the dishwasher.” It is then your place to work within that system of thought, not to change it, or debate it. When you are dying, or critically ill, you have already figured out what brings you comfort. We as caregivers need to listen to that, leave our own dishwashing techniques at the door, and listen to them. If we really listen, we can help them find that emotional, psychological, social and spiritual comfort they need and want.